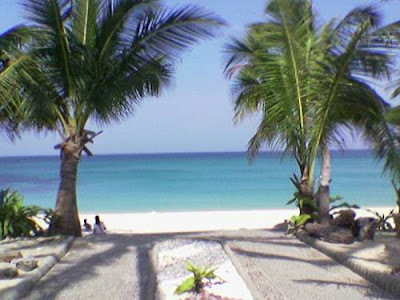 Located at the northernmost tip of Luzon, Pagudpud has crystal blue waters and white sand beaches that any local or tourist would surely want to visit. From UST, take the Lacson Exit. Turn right at A. H. Lacson (Gov. Forbes), and walk towards Espana. The Florida Liner and RCJ bus terminals are at A. H. Lacson (Gov. Forbes) corner Espana. Ride a Florida Liner or RCJ bus to Pagudpud or to Cagayan via Pagudpud, and ask the conductor to drop you off at Pagudpud's Baduang Market. The ride takes 9-12 hours. Go to Laoag. The ride takes about 10 hours. Ride a tricycle to the Pagudpud bus station. Ride a minibus to Pagudpud. The ride takes 1-2 hours. Ride a tricycle to Claveria Tours. Ride a bus to Claveria, Cagayan, and ask the conductor to drop you off at Pagudpud's Baduang Market. The ride takes 1-2 hours. Ride a bus to Tuguegarao, and ask the conductor to drop you off at Pagudpud. Ride a tricycle to the town proper. Ride a jeep to Pagudpud. The ride takes about 2 hours. Go to Vigan. The ride takes 5-7 hours. From Vigan, ride a minibus to Laoag. The ride takes 1-2 hours. Ride a tricycle to the Pagudpud bus station. Ride a minibus to Pagudpud. The ride takes 1-2 hours. Ride a tricycle to Claveria Tours. Ride a bus to Claveria, Cagayan, and ask the conductor to drop you off at Pagudpud's Baduang Market. The ride takes 1-2 hours. Ride a bus to Tuguegarao, and ask the conductor to drop you off at Pagudpud. Ride a tricycle to the town proper. From the Partas Bus Terminal on Quezon Ave, San Fernando, La Union, ride a Partas bus to Vigan. The ride takes 3-4 hours. Ride a Farinas bus or Autobus to Vigan The ride takes 3-4 hours. Ride a GMW or Florida Liner bus to Laoag, Vigan, or Abra, and ask the conductor to drop you off at Pagudpud's Baduang Market. Ride a minibus to Laoag. The ride takes 1-2 hours.